My husband made French toast for breakfast, and when it was almost ready to eat, we realized we were out of maple syrup! Bring water and sugar to a boil. 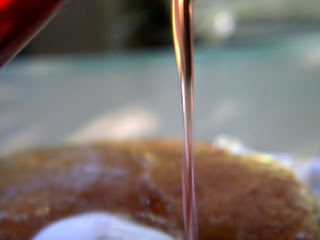 Add corn syrup and let simmer, stirring frequently until mixture is transparent. Remove from heat and add maple extract. Start with ½ tsp, add more to taste. You can make lots of substitutions for this recipe, and it will still taste great. Brown sugar instead of white, vanilla extract instead of maple (or whatever other flavor you want), and you can even add some fruit to the boiling mixture for fruit flavored syrup. I’m going to make some more later, using turbinado (raw natural sugar) and less corn syrup. It won’t be healthy, but healthier is always good!